With two ovens, this Britannia Q Line 90cm Twin RC9TIQLS Electric Range Cooker gives you a good amount of room to multitask and prepare different dishes at the same time. A Quickstart feature in the main oven quickly pre-heats the appliance so that you can get cooking sooner – plus it's economical. 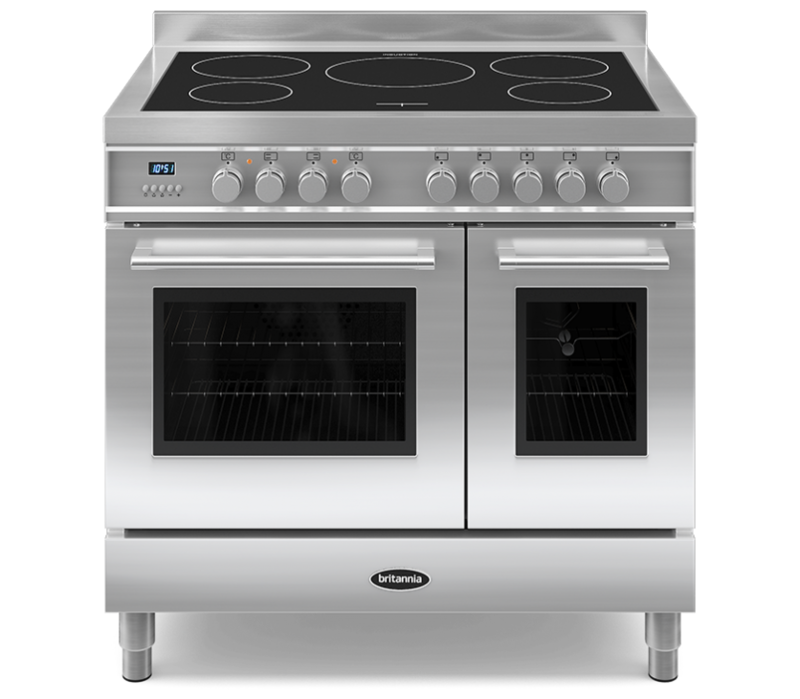 In the 28-litre second oven you have four cooking functions at your disposal, including combinations of fan and conventional heating. It's ideal for preparing smaller meals or accompaniments to your main course. There's also a rotisserie in the second oven that allows you to prepare moist, tender chicken and turkey more quickly than with conventional roasting. Inside the oven, a thermostatically controlled fan stops the fascia from overheating, so it's always safe to touch. There's also triple-glazed door glass to stop the doors from getting too hot. The hob features hot hob indicators so you know when it's too hot to touch. The beauty of induction cooking is that should a pan be removed or an incompatible item be placed on the hob, the induction connection stops working, making for rapid cool-down times, saving energy and helping to prevent accidents. Easy-clean enamel makes each oven on the Britannia RC9TIQLS Electric Range Cooker quick and simple to wipe clean. An interior light allows you to see clearly with the door closed, so you can check your meals without having to open each compartment and waste heat or spoil your food. Keep essential cookware in the handy storage compartment at the bottom of the cooker, and get the appliance to the most comfortable position for you with its height-adjustable legs.